The 434th Hash is the "The Great Ulsan Hash" in conjunction with the HHI Autumn Gathering. Take the HHI supplied transportation from outside the Foreigners Compound at 11:20 am on Saturday 23rd October. Please register with "Hash Cash" to record your run, prior to the run on site at 13:30. The Hares will be "Snake","Can Do", "Roo" "Mr Chips" and "Say no More". HHI will be providing the sustenance at the "ON ON" location. 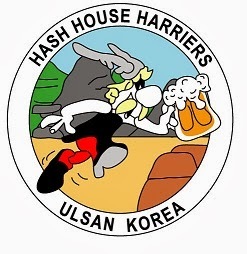 All Ulsan HHH members are asked to support the run and help as requested to make this a success for the pre-registered 250 runners, many whom are Hash Virgins. A large circle is expected, with all in great singing voices!